Good morning. Today is a good day for 80 million European citizens with a disability. One day ahead of the International Day of Persons with a Disability, I am happy to present the European Accessibility Act. People with disabilities still face major barriers in life, which makes it more difficult for them to fully and equally participate in society. They are less employed and 30% are at risk of poverty and social exclusion, which is higher than the EU average. The Directive I propose today will make the lives of citizens with disabilities easier, because it will improve access to those products and services which are key for more participation in society and more autonomy in life. Take for example digital devices, such as smartphones, or services such as e-banking or webshops. These are changing our society and economy. And they make our lives easier. If these products and services are made accessible for people with disabilities, they offer a whole range of new opportunities to participate in society and to make independent choices. As such, digital technologies can be a real catalyst for social inclusion. The reason why we are proposing this today goes back the United Nations Convention on the Rights of Persons with Disabilities. Both the EU and its 25 Member States already have ratified this Convention. This is our common commitment - of both the EU and its Member States - to make products, services and buildings more accessible. Member States have started to legislate on accessibility independently in an uncoordinated way. This stands in the way of creating a deeper and fairer internal market. Unless we take action at EU level, divergence in the national rules will increase. This would make it more difficult for industry to sell products and services across borders and it is also bad for citizens who are most in need of accessible products and services. This reinforces the case for EU action. What we propose today is to create common European accessibility requirements for key products and services used by people in everyday life. For example computers, ticket and check-in machines, smartphones, TV equipment, automatic teller machines (ATMs), e-banking, e-books and e-commerce. The functional requirements we propose in the Accessibility Act establish accessibility principles, instead of prescribing the detailed technical solutions. This leaves room for innovation and for flexibility. Companies who comply with those common accessibility features, will have the legal certainty that they can export their products and services throughout the EU. Just to give you a few examples, ATMs will provide sockets for headphones so that blind persons can withdraw money with the support of audio instructions. Another example - keyboards will provide tactual clues. ATMs will also have visual alerts in addition to audible signals to indicate where the cards need to be introduced or where the money comes out. You find more examples in the press release and memo for you. This can clearly make life easier for people with disabilities, including older people facing functional limitations. With demographic ageing, the demand for accessible products and services will only increase in the next generations. I believe this is a win-win situation for everybody. Thanks to this harmonising proposal, the cost for companies and Member States will be reduced. Moreover, EU action can also have a positive impact on public budgets on the long-term, by reducing the dependency of older and disabled people. Companies can take full advantage of the internal market and consumers can profit from a wider offer of accessible products and services, which will result in better prices and more social inclusion. In short, this proposal puts our internal market directly at the service of people. 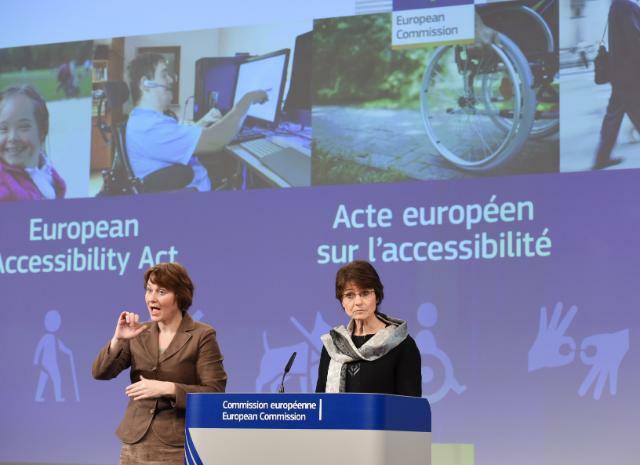 Ahead of the International Day of People with Disabilities tomorrow, the European Accessibility Act is a concrete proof of the EU's commitment to remove barriers for our fellow citizens with disabilities and to promote independent living. Thank you.